Pip the Beach Cat is soft, orange, and striped, with round, white paws and big, attentive eyes. 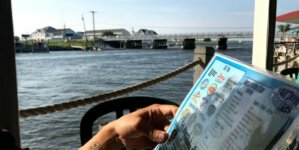 He’s seven or eight months old and small in stature, but wherever he is in Ocean City — on the Boardwalk, on a paddleboard, or playing skee ball — people take notice. Not just because he’s so cute, which he is, but also because his escapades around town are well-documented on Facebook, Instagram, and even Tik Tok. In just a few short months, Pip has taken the peninsula by storm, and is already on his way to celebrity/mascot status in Ocean City. Soon, Pip will be immortalized as an illustrated character in a children’s guidebook, where his character will pose in front of iconic local landmarks and show kids what they can expect on their Ocean City vacation. The book is slated to hit shelves by May of 2019, less than a year after Pip was first discovered during a September thunderstorm. Pip sees his first wave. It was during the storm that Pip first showed up at the door of an unsuspecting family in Berlin. 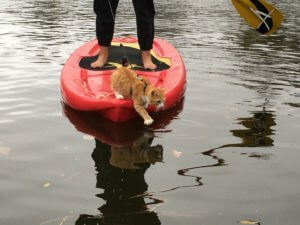 He was dirty and tiny, according to his now-owner Emily Meadows, and only a kitten. The family passed him on to Meadows’ sister and he eventually made his way to Meadows’ house in Ocean City, where she and her husband intended to babysit the cat for a little while and eventually take him to the local humane society. Unfortunately, but fatefully, the humane society was full. By the end of September, Pip had torn up the Meadows’ house, climbing up screens, tearing plants out of planters, and pestering their other two cats. 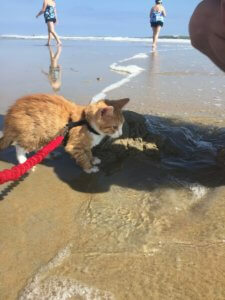 They realized they had to get him out of the house and let him release some energy, so they put him on a harness and leash and took him to the beach at Assateague. As soon as they put him in the sand, he immediately started sniffing around and excitedly digging holes on the beach. Ever since the couple discovered Pip’s adventurous spirit, Meadows has been documenting the cat’s escapades on various Pip-dedicated social media accounts. Pip lovers can see him getting the spa treatment in local hotels, wrapped in a towel with cucumbers over his eyes, or working the front counter at Ocean Gallery, or sitting on the Boardwalk with a piece of Fisher’s Popcorn stuck to his mouth. In one photo from late November, he’s poised to lay his paw on an ink pad and “sign” the contract for his first book. Many of Pip’s adventures will be turned into illustrations, aimed to teach children about Ocean City and what things they can do when they’re on vacation with their families, where they can follow in Pip’s ice cream-eating and carousel-riding footsteps. 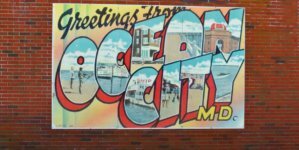 Meadows said that since Pip’s come into her life, she herself has “rediscovered” Ocean City, the town she grew up in. As for the landmarks and hotspots that Pip is photographed at, they’re mostly chosen based on where people love to go in Ocean City and where Meadows and her friends work in town. She’s asked fans on Pip’s social media where they’d like to see him pictured in the book, and answers have understandably included Thrasher’s, Fisher’s Popcorn, Dolle’s, and Trimper’s Rides. So at Trimper’s Rides, for example, Pip will be riding the carousel, but the book won’t give too much information or history away — the hope is that kids will want to visit these Ocean City landmarks and then learn more for themselves. 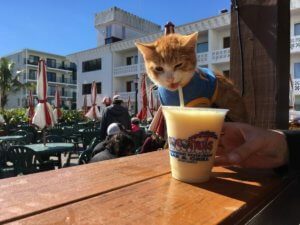 Pip enjoys an icy drink. 15% of the book’s profits will be donated to local charities, including Worcester County’s child advocacy group The Cricket Center, nonprofit surf club Surf Into Integrity, and the local humane society. $3 from each book bought at a charity event will be donated, and the Pip team additionally plan on selling stuffed animal versions of the cat called “Little Pips.” They hope to donate one Little Pip to a nursing home or homeless shelter for each one that’s sold. 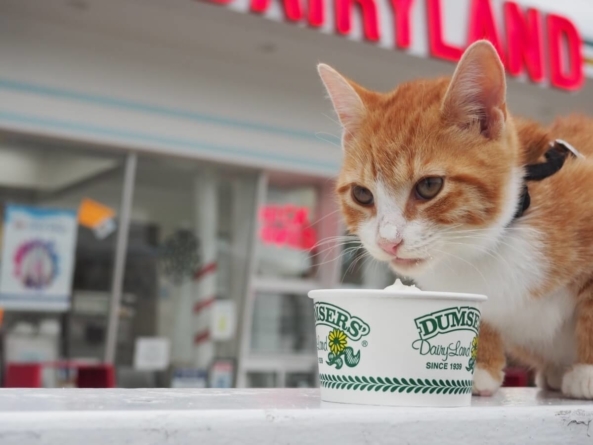 Meadows hopes that the guidebook will not only teach kids about Ocean City and present the town as a family-friendly resort, but will also inspire its readers to follow their dreams and maybe even write a book of their own — after all, if a cat can do it, so can they. And, by Pip’s very nature, his adventures are also showing the world a stereotype-defying view of his species. If anyone wants Pip to come into their business to take photos and meet new friends, Meadows says that all they have to do is ask. She wants to introduce Pip to as many people as possible. “We’re trying to turn him into something that’s going to do good for the world while letting him show who he really is as a cat,” she said. As for future plans after completing his book, Pip hopes to explore more places around town, visit the waterpark at Jolly Roger, and maybe even join the Ocean City Beach Patrol. 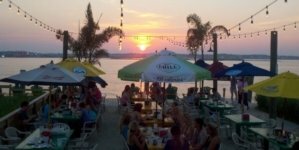 He can be found on Facebook, Instagram, Tik Tok, and his website, Pip’s Guide to Ocean City, Md. Photos courtesy of Emily Meadows. 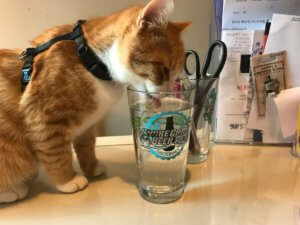 Pip gets a drink in the OceanCity.com office after a long day of meetings and interviews.